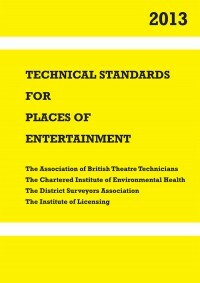 Stock of this essential book – the first new edition in five years and now including material previously contained in the Model National Standard Conditions for Places of Entertainment – can be found on the ABTT’s Stand, A53, at ExCeL London, from this Sunday 6 October, at a reduced rate, held for all four days of the show. 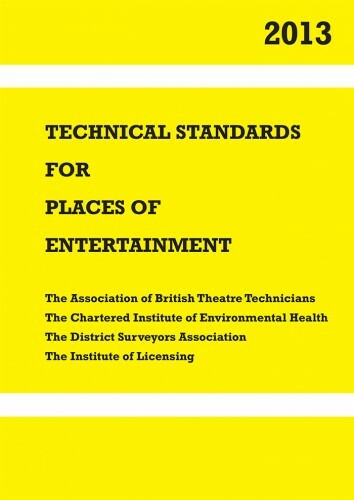 It will also be on sale on the stand of Entertainment Technology Press Ltd.
‘Construction Design & Management Regulations 2014: how will this make an impact on the theatre and events industries?’ will discuss the Health & Safety Executive’s consideration of modification to the Regulations. If they become applicable to all activities involving structural elements, such as theatre sets, will they require significant changes to the management of safety during the phases of a theatre production and who will have the Duty of Care? Robin Townley, the Association’s AEO will host this session, on Wednesday 9 October, 11.00am - 12.00pm, with guest speakers Gavin Bull, from the HSE and Michael Anderson, Chairman of the ABTT Theatre Safety Committee. The second session on Tuesday 8 October, 3.30pm - 4.30pm, Technical Access Passport Scheme (TAP): Development Update, presented by ABTT director and Trustee, Tom Mannings (head of technical, English National Opera), with trackingThis Ltd’s Chris Paul, will keep all existing and potential users of the TAP scheme informed of the latest add-ons, in particular the trainer module with its diary functionality & enriched usability, which is particularly applicable to training providers who serve the entertainment industry.